Washington-(Maalimahanews)– US President Donald Trump has threatened to cut aid to countries that vote in favour of a draft UN resolution condemning the US decision to recognise Jerusalem as the capital of Israel.Trump said at the White House on Wednesday the US would be “watching those votes” in the General Assembly. “They take hundreds of millions of dollars and even billions of dollars, and then they vote against us. Well, we’re watching those votes. Let them vote against us. We’ll save a lot. We don’t care,” Reuters news agency quoted Trump as saying. Haley also said on Twitter “the US will be taking names” of countries that vote in favour of the resolution. 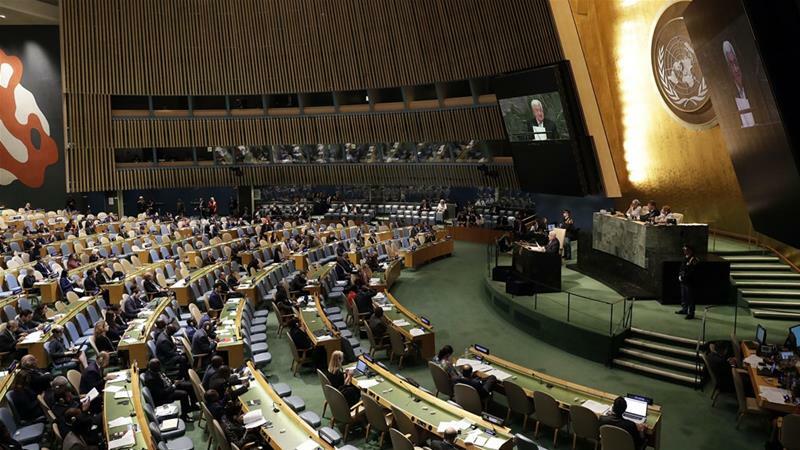 Riyad al-Malki,Palestinian foreign minister,on Wednesday accused the US of “threatening” member countries of the UN General Assembly in advance of the vote. Malki said American officials were “committing another mistake when they have distributed this famous letter trying to threaten countries, [and] threaten their sovereign decision to choose how to vote”. “This is really a new definition of world order in politics and it seems that the American administration … are putting their stamp on a new political reality that many countries will reject,” Malki said. The UN session would show “how many countries will opt to vote with their conscience”. Trumpdeclaredon December 6Jerusalem to be Israel’s capital and announced the intention to move its embassy to the city. The contentious move prompted large-scaleprotestsand condemnation from leaders around the world.